These sets are best for those in seeking a broad range of resistance levels. We've bundled a series of resistance band combinations based on the user's size and targeted use. Owning various sizes offers you a wider selection of exercise capabilities and a logical way to increase or decrease the amount of desired tension as your warm-up or burn out. 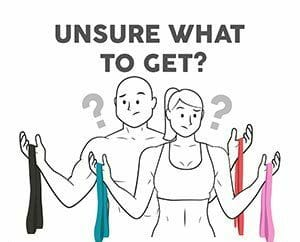 Let us know if you read through and need some assistance selecting the right resistance band set for you. 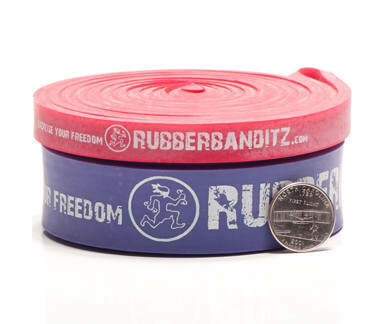 This lightweight band trio has several different fitness functions. Perform almost any high rep exercise outlined in our manual. This low tension provides a self-contained gym and offers the perfect training tool for both large and small muscle group exercises. This popular exercise band set is commonly used for assisted bodyweight training, such as assisted pull-ups because it gives you up to 8 possible combinations and allows for a range of resistance levels. This accommodates gradual increases in your strength and allows you to do drop sets - i.e. doing a set of pull ups with just the Robust band, and then adding the heavy band to eek out a few more reps. This heavyweight set is a practical solution for calisthenics and assisted pull up band training for heavier adults or for powerlifting exercises. Fasten all three to the pullup bar and easily swap in the right band needed as you fatigue or perform different exercises in succession. 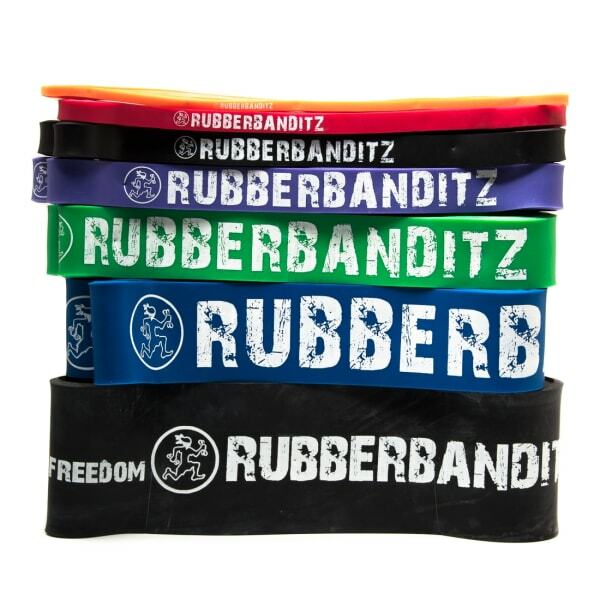 This complete gym-quality series of bands offer every resistance levels (from 5-300+ lbs.) you and/or your clients will need for full body fitness training. Replicate or enhances any gym exercise. This set is popular among trainers, studios, home gyms, extreme fitness enthusiasts and CrossFit boxes. Using elastic bands for the first time. Opened up the medium band - excellent feel. Hope it will last me much longer than 1 year. Good products, good resistance, good customer service! I've never had pull up bands, so I can't make any comparisons to other brands. I have been quite pleased with my purchase and can feel myself getting better at pull ups. These are a lot better than using a chair. My wife has trouble with them, but mainly because she is too short for our pull up bar. I ordered bands to work on increasing my ability to do pull-ups. I am a career firefighter/paramedic and having strength, flexibility, and endurance are key. I have noticed a difference since using the bands! Great product, thanks! 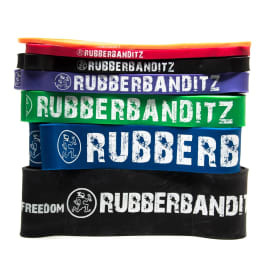 These bands are absolutely the best! My pullups were absoulutely horrible compared to my young Marine days and I was really frustrated because pullups are one of the best excercises that you can do, with that being said my pull ups now have been on track started with the heavy band but this past week dropped down to the purple and black. Solid sets and your product completely motivates me to push out one or two more. I use them at the gym and I always get asked if they help the answer is always Yes! Gives me the right amount of assistance not to much not to little. Great Product and Shipping was super fast!! !